K.M. Herkes is the author of The Restoration Adventures books and the Rough Passages books. Her writing is a mix of sci-fi and fantasy, and I’m getting ready to read her book Controlled Descent because I’ve heard wonderful things about her writing. Herkes is also an active blogger with all kinds of fun stuff on her blog, such as character information, reviews, and writing advice. I highly recommend checking out her blog at dawnrigger.com. Thank you, K.M., for the nomination! This is an easy peasy one for me. I’d be an apple tree. I had an apple tree growing up that I could frequently be found in. I loved to climb as high as I could (which wasn’t that high because the tree wasn’t very tall, but considering my fear of heights, this was impressive). The world always looked different to me from the tree branch, and I used to fancy that I had climbed into another world. What’s one of your cherished habits, rituals, or routines? (writing-related or otherwise) A thing you do regularly for personal satisfaction alone. I’d have to say my one of my most cherished habits would be sitting in my chair cuddled up with my four dogs and reading. I only get to do this for a half hour to an hour every night, but it is definitely my most relaxing time of the day! What is it about your favorite color that puts it at the top of the list? This is a difficult question. I’ve never put that much thought into my favorite color before. Honestly, I have three favorites (green, blue, and purple), but for the purpose of this question, I will stick with green because I can identify what puts it at the top of my list. My grandmother’s favorite color was green, and she and I were very close. One of the stories I remember hearing was that when I was a toddler, my grandmother held up two different colored stuffed rabbits and asked me to choose which one I wanted. When I chose green, she was delighted. I still have that rabbit. Also, green is the color of trees and grass, and I couldn’t live without either of those. Which six fictional or historical people would you bring together for a weekend house party in the big country manor you inherit from a long-lost relative? The Morrigan would be at the top of the list because she’s my favorite figure from mythology. However, since she was a battle goddess, she might not be the best party guest . . . Manawyddan, Gwydion, and Harry Dresden because all are skilled magic workers. I think watching them try to outdo each other would be great entertainment, especially with Dresden’s personality. I would also have to invite Dagda because he has a club that kills when he strikes the person with one end, and with the other end, he can revive them. I would probably just sit with him for hours enjoying that show. Finally, my imaginary party wouldn’t be complete without Neutria the warrior spider (from the amazing Jen Ponce’s Devany Miller series). I love all things spider, and I’m pretty sure I was a spider in another life. I’m not really sure I want to know what this guest list says about me. Moving on. Where would you go if you won an all expenses paid 4-week family vacation to anywhere in the world? Presume zero scheduling/school/medical conflicts. Britain, Ireland, Scotland, and Wales. Yes, I want to see them all. No, I won’t pick just one. What would you do there once you arrived? The first thing I would do would be to visit Stonehenge. Then I’d travel all over Britain, Ireland, Scotland, and Wales to see every castle and stone circle there! When did you first show your writing to someone else, and what happened? The first time I remember showing my writing to someone was when I showed it to a boyfriend as a teenager, and he liked it so much that he encouraged me to continue writing. What bit of writing made your heart bleed to write but clawed its way out despite the pain. Blog, fiction, Facebook post…nominee’s choice. I think all of it makes my heart bleed. Just kidding. I can’t recall writing anything that was so painful it made my heart bleed, at least not yet. I have a character that I love in the novel I’m writing, and I know this character has to die. I have a feeling this character’s death will upset me. I’ve already tried a couple of times to convince myself the character doesn’t need to die! For me, these are two different questions. The fictional passage that made me laugh the most to write would be one involving one of my favorite characters named Alex. She’s goofy and has a lot of great one-liners. The story that I had the most fun creating is called Stolen Dreams and can be found on my blog. I wrote this flash fiction for a contest, and I enjoyed creating the character, Melaina. She’s been trapped in the world of dreams and decides it’s time to escape. Pickled vegetables: delicious or disgusting? Disgusting. I like my vegetables fresh. Thank the blogger who nominated you (that’s me) and link back to my website (I want to read your answers!) 🙂 My link is smlowry.com. 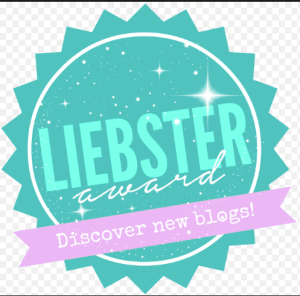 Copy and paste the Liebster Award into your post. Nominate ten bloggers and inform them you’ve nominated them through their blog or other social media. Who is your all-time favorite fictional character? If you could travel to any time in the past or future, what time would you choose and why? What was the last series you binge watched or binge read? Do you prefer pizza or hamburgers (or veggie burgers if you’re vegetarian/vegan)? What weather do you hate the most? What is your favorite thing about blogging/writing? What is your favorite fantasy/sci-fi/mythological creature?